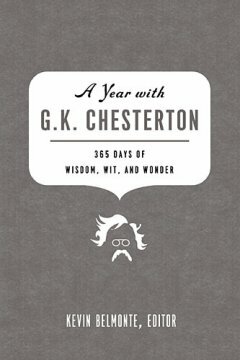 A Year with G. K. Chesterton is an anthology of some of Chesterton’s best works presented in concise, memorable selections. But I personally find Chesterton's philosophy quite difficult to comprehend (although some of which I can appreciate to be deeply profound) and his poetic writing style is quite different from our modern-day writing. The devil can quote Scripture for his purpose; and the text of Scripture which he now most commonly quotes is, “The Kingdom of heaven is within you.” That text has been the stay and support of more Pharisees and prigs and self-righteous spiritual bullies than all the dogmas in creation; it has served to identify self-satisfaction with the peace that passes all understanding. Here am only trying to describe the enormous emotions which cannot be described. And the strongest emotion was that life was as precious as it was puzzling. It was an ecstasy because it was an adventure; it was an adventure because it was an opportunity. The goodness of the fairy tale was not affected by the fact that there might be more dragons than princesses; it was good to be in a fairy tale. The test of all happiness is gratitude; and I felt grateful, though I hardly knew to whom. Children are grateful when Santa Claus puts in their stockings gifts of toys or sweets. Could I not be grateful to Santa Claus when he put in my stockings the gift of two miraculous legs? We thank people for birthday presents of cigars and slippers. Can I thank no one for the birthday present of birth? Poetry is sane because it floats easily in an infinite sea; reason seeks to cross the infinite sea, and so make it finite. The result is mental exhaustion.... To accept everything is an exercise, to understand everything a strain. The poet only desires exaltation and expansion. The poet only asks to get his head into the heavens. It is the logician who seeks to get the heavens into his head -- and it is his head that splits. Until we realize that things might not be, we cannot realize that things are. Until we see the background of darkness we cannot admire the light as a single and created thing. As soon as we have seen the darkness, all light is lightening, sudden, blinding, and divine.